Simply adore these plants that are such prolific bloomers all year round in our tropical sun and high humidity. Flowers come in such a diverse range of marvelous colors and shades that are so exciting and captivating, making their slightly unpleasant scent seem so distant and tolerable. Some gardeners may be wary of growing them as they are considered noxious weeds in some regions and included among 100 of the world’s worst invasive species, as recorded in the Global Invasive Species Database (GISD). Well, avoid the wild ones and go for those cultivated varieties sold in the garden centres instead, which are mostly non-invasive and of shorter hybrids. We have grown these in pots and in flower beds and found them to be easily uprooted. Anyway, be aware that its leaves and unripe fruits are highly toxic, and may be fatal if ingested, so do keep out of reach of children and pets. 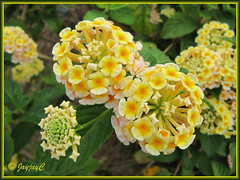 Read more about what lantana growers around the world have to say at Dave’s Garden. Plant type: Perennial flowering shrub (or annual in cold regions) that is native to tropical region in Central and South America. 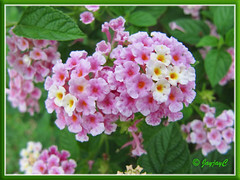 Now, popularly grown in gardens around the world as an ornamental plant. 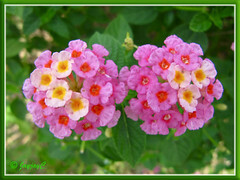 Features: Lantana camara is the most cultivated species of among 150 species of the genus Lantana. A highly variable species with more than 650 varieties grown worldwide, in many different forms and a multitude of colors. It is a vigorous shrub that grows to 1-2 meters or more in height and as widely spread, though newer cultivars and varieties are much shorter and compact, with a mounding habit. It can be erect, sprawling or vinelike, and takes well to repeated hard pruning. It has a very strong root system that is fire-resistant. It produces green-colored leaves that are opposite or whorled, ovate with a pointed tip and rounded base, and have serrated margin and a rugose surface. Also, they emit a typical herbal scent when crushed, offensive to some people but pleasant to others. Branches and leaves are covered with rough hairs that may cause skin irritation or rash allergies in some people when handled. L. camara blooms almost non-stop throughout the year in the tropics, but in temperate regions they bloom from summer to late fall. 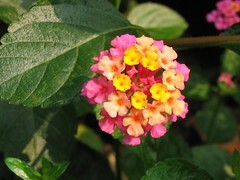 Multi-colored scented flowers are small and tubular, and borne in axillary long-stalked heads or flat-topped clusters called umbels, measuring 2-5 cm across. 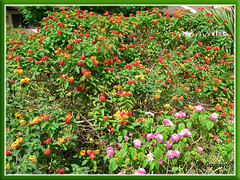 Flower colors are endless, ranging from white to yellow, orange to red, pink and purple to rose, and flower clusters are seen in beautiful and attractive color combination that also changes as the flowers age. 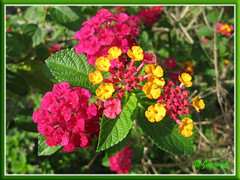 Lantana produces small and fleshy fruits too that are greenish-blue maturing to purplish black, and consumed by birds that dispersed the seeds. However, quite many of the cultivated hybrids and varieties are sterile (do not bear fruits/seeds), hence are non-invasive. 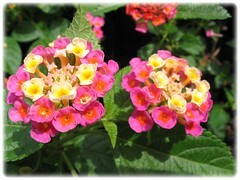 Culture (Care): L. camara is an easy to grow plant that does not need much maintenance. Being a tropical plant, it is happy in full sun and humid conditions, though it is very versatile and has been known to grow in diverse habitats under varying climatic conditions. Light: Full sun or partial shade. Grows best and flowers prolifically in full sun. 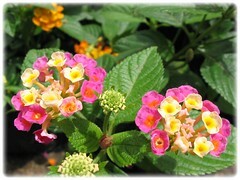 Moisture: Require adequate water regularly though can be very drought resistant once established. Over watering can cause root rot or yellowing of leaves. Soil: It is adaptable to most soil types, but must be well-drained. It is salt tolerant too. 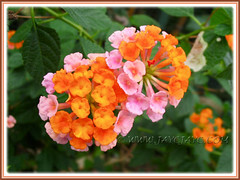 Others: Prune whenever necessary to maintain shape, encourage bushiness and flowering. 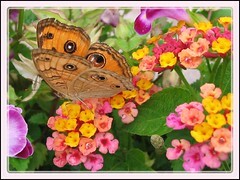 Feed sparingly as too much fertilizer will promote more leaves and less flowers. It is relatively pest free except for mealy bugs and whiteflies that are very attracted to it. 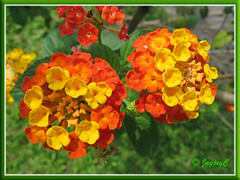 Lantana camara is also susceptible to brown leaf spots caused by a fungus, Pseudocercospora guianensis. 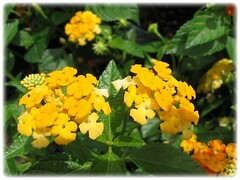 Read further for some Q&A on Lantana propagation, pruning and care at HortChat.com. For temperate zones: Hardiness: USDA Zones 8-11. It may die back to the ground after frost at 28 degrees F (-2.2 degrees C) but recovers quickly every spring or when warm weather returns. Propagation: From seeds that germinate easily or cuttings that root easily. 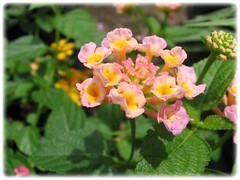 Lantana hybrids and named varieties must be propagated by cuttings. 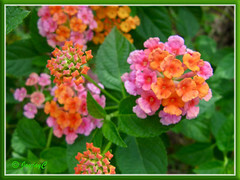 Usage: Plant Shrub Verbena or L. camara in mixed beds and borders, as a ground cover, shrub or hedge to add beauty and color to your garden landscape. It grows well in containers as a lovely specimen bush or above-ground planters to line road-dividers, walkways, streets, etc. 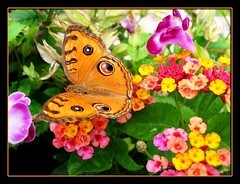 Planted in hanging pots/baskets, it will be an attractive specimen at a patio, deck or porch. 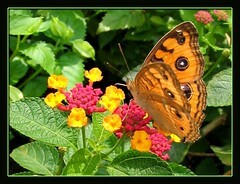 An excellent shrub to draw butterflies, bees and birds to your garden. In some of our local garden centres, we’ve seen many colored varieties grafted onto a single trunk and trained as a standard specimen which is stunning, truly an attention grabber! 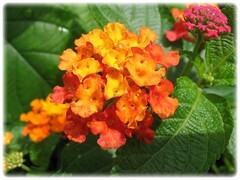 As Lantana plant tolerates salt spray, it is popularly grown along coastal regions, and also used for xeriscaping because the plant is very drought resistant as well. 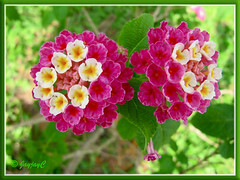 L. camara has medicinal uses too, herbal and folkloric in nature. Other uses include the usage of its stems to produce household furnitures and pulp for paper, in addition to using its twigs and branches as simple brooms or as fuel. Know more at ISSG (Invasive Species Specialist Group) site. or is it ‘Lucky Red Hot Improved’?